Whodaguy? Ron Jacobs, of course. Radio legend, an original Poi Boy and creator of the nationally syndicated "American Top 40." Since entering the radio biz as a teen in the '50s, Jacobs has been part -- in some way, big or small -- of most of the major developments in the industry, from the dawn of rock 'n' roll into the digital age. Along the way he's cultivated his interests in the Hawaiian music scene as well. Today he's carving out a place in cyberspace, as host of the live online broadcasts on www.WhodaguyHawaii.com. "WDG Hawaii is a labor of love, a mission, my final one, not a gig or an ego trip," Jacobs says. "It's funded by me and my friends, all of whom support the spreading of Hawaii's music around the globe via Internet." 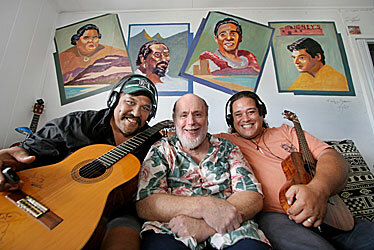 Ron Jacobs, center, hosted Kawika Kahiapo, left and Keale on the online program broadcast from his home. 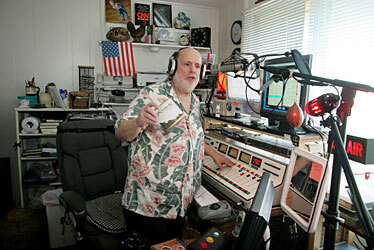 Anybody familiar with Hawaii's pop radio history knows Ron Jacobs. Jacobs was doing radio here when he was still a teenager, in the mid-'50s when the "suits" who ran radio here were saying that rock 'n' roll was just another passing fad, like Davy Crockett caps and the hula hoop. Jacobs was there at the beginning of local Top 40 radio, playing rock records at KHVH and coming up with such promotional stunts as having an Elvis look-alike ride around Oahu during Presley's first visit. Jacobs was there again, as program director and one of the original "Poi Boys" at KPOI in 1959. This time the "suits" said that people would never pronounce radio station call letters as if they were words. Wrong again. In 1964, after serving 30 days in prison for possession of 3 milligrams of marijuana, Jacobs moved to the mainland. His contributions there included the launch of 93/KHJ "Boss Radio" in Los Angeles, producing the first "rockumentary" for radio, "The History of Rock and Roll," in 1969, and developing the first nationally syndicated countdown show, "American Top 40," in 1970. When Jacobs returned to Hawaii in the mid-'70s, he was "Whodaguy Ron Jacobs," the high-profile morning drive personality at KKUA. Jacobs made his show a showcase for Hawaiian music and Hawaiian entertainers of all eras. He also introduced the "Homegrown" album, a promotional concept that he'd created at KGB-FM in San Diego. "Homegrown" was even more popular here than in California, with local editions raising more than $150,000 for Habilitat. Fast-forward almost three decades and Jacobs is again exploring new ideas as he promotes Hawaiian music with his online broadcast project www.WhodaguyHawaii.com. Question: When I asked you if what you're doing is a podcast, you replied that it's "to a podcast what an Indy 500 race car is to a '57 Chevy." I understand the difference between the cars ... but explain the Whodaguy-versus-podcast comparison. Answer: Semantics haven't kept pace with the new technology, but it comes down to this: Podcasts are delayed. Webcasts like WhodaguyHawaii. com are live, although they can be saved for replay. ... "Podcasting" is nothing more than a phrase heard all the time in the 1940s though the '60s: "taped for release at this more convenient time." Webcasting like my thing is live! It can be heard on anything with a network browser on every consumer computer sold. Q: How broad or deep is the WhodaguyHawaii.com music library? A: Currently over 3,000 different titles. Counting duplicate versions of the same song, over 3,500 -- and adding more all the time. Chronologically, the material dates back to the earliest Edison cylinder recordings ... through current releases by Teresa Bright, Barefoot Natives and Maunalua. Several major labels and distributors have provided their entire catalogs, including Hula Records, Cord International, Punahele Productions and many of the newer "indie" labels. Our criteria is that "Hawaiian" music is anything written about or for Hawaii, performed in Hawaii or elsewhere by mostly "local" musicians. We also include some traditional and popular versions of songs from all of Polynesia. Q: I heard your on-air interview this past week with Teresa Bright. Will you also be going back into your archives? A: WhodaguyHawaii.com programs everything and anything, including archive materials dating back to the 1960s. Between artist interviews conducted on the mainland and four hours of weekly "Aloha Friday" shows at KKUA in the mid-'70s, I've interviewed 400-plus musicians. So the answer is yes, and we will make available selected programs as podcasts (play on demand) when we have enough to justify. Q: Who is listening these days? A: The "coverage map" shows hits from Hawaii, all across the U.S. -- thickest towards the East and West -- and lower Canada, the U.K., Norway, Germany, Sweden, Nigeria, Ukraine, India, China, Japan, Australia and Cuba. Twenty-two percent are listening for more than an hour. Q: A century ago recorded music existed only as singles, with one song per cylinder. Now we're seeing a return of the single as a sales unit in the form of individual legal downloads. Do you see a timetable for the phasing out of "hard copy" CDs the way that 78 rpm records and pre-recorded reel-to-reel tapes were phased out of the market in the past? A: My observation is that every consumer audio method and resulting (playback) device moves into the market exponentially: 45 rpm records wiped out 78s quickly, LP albums and players even quicker. We moved past eight-track (tapes), not around long enough to take hold, to cassettes ... to compact disc and those even cheaper and more portable players. Then cometh the iPod. The music does not "exist" in the sense of a tangible disc. With instant transfer of highest-quality audio, with cover art, total inventory -- even direct-from-artist -- and you have the fastest-selling device in human history. Therefore, in answer to your question, CDs will become antiquated quicker than any form of recorded music. They will be as common as a piano roll before we know it. Q: You also mention in your mission statement that you've had several "Big Ideas That Worked" in your lifetime and that WhodaguyHawaii.com is the latest. For the record, what were the others? A: The "Big Ideas" that proved the following statements wrong: 1) In 1957, rock 'n' roll is a passing fad. 2) In 1959, no one is going to say call letters like a word (referring to KPOI). 3) In 1965, an obsolete word like "boss" will never catch on. After "Boss Radio" hit, Ford came out with a "Boss" Mustang. 3) In 1970, no one will listen to a countdown show that's not done by a local jock. 4) In 1972, simulcasting AM and FM stations is needless "duplication." 5) In 1973, an album with amateurs performing their own songs will never work. "Homegrown" albums have raised nearly $350,00 for charities in California and Hawaii. That's five of them. Q: Lastly, is WhodaguyHawaii.com a hobby, a listener-subsidized entity like public radio or a business that will eventually run commercials like traditional radio? A: WDG Hawaii is a labor of love, a mission, my final one, not a gig or an ego trip. My résumé is fine as it is. It's funded by me and my friends, all of whom support the spreading of Hawaii's music around the globe via Internet. Initial backers are Kevin Gershan of "Entertainment Tonight LA" and Chip Monck, the man who staged Woodstock and did the Stones for more than a decade. If and when there are paid supporters, they will be mentioned once an hour in the "institutional" style of public broadcasting. Equipment and services are donated by RJ colleagues on the mainland and locally. All proceeds go to the Association for Preservation of Hawaiiana Online, specifically to fund music scholarships for island students, and at least seed capital to build the Hawaiian Music Hall of Fame. Rock 'n' roll and country have "HOFs." Hawaii has some photos and captions on panels in the Paliku Theatre lobby. Territorialwairwaves.com is the newest edition of "Territorial Airwaves," the long-running forum of Hawaii musicologist Harry B. Soria Jr.
Soria debuted on what was then Hawaiian Radio KCCN in 1979. The show began streaming in real time in 2000 and began offering on-demand download shows on www.hawaiian105.com and www.am940hawaii.com in 2006. Soria introduced www.territorialairwaves.com in 2006, allowing listeners to choose from an array of recorded short features. Soria describes it as "an ever-expanding Hawaiian sound museum." Alohajoe.com was launched by Aloha Joe in June 1994. Joe broadcasts live for two hours on weekdays and three hours on Saturdays with rebroadcasts for different time zones. "If it's island music, we play it no matter when it was recorded or where the artist lives," Joe says. His play-list "includes early chant to Aziel ... once a selection is in play it stays (on the play-list)." That includes jazz, pop, hip-hop and Jawaiian, but Joe adds that "we play steel guitar, ukulele and slack key every hour." Joe says www.alohajoe.com is "a commercial station supported by advertising dollars just like every real radio station. ... This is a business." » Colt: good to go?